Sometimes fiction beats reality. People usually focus their atention in movie characters. Courageous, powerful, intelligent people. But not very often do people realise there are also lots of other things in movies which are miles better than reality, such as a clothes, cars, houses, products… and, of course, brands and logo designs. There must be great naming and branding consultants behind those creations because some of them are amazing. 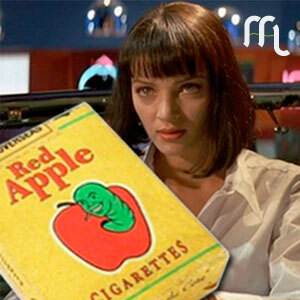 If Red Apple Cigarettes were real I’d start smoking. Some of those fictional branding creations are considerably more popular and effective than real ones. Actually, fake brands like Duff Beer, Red Apple (thanks to Tarantino), Laramie, Kahuna Burger, Let’s, Oceanic Airlines, are quite good examples. Let’s think about it: They look pretty cool and people keep in mind its names and logos whereas a host of similar real brands don’t. The influence and de power of these brands are so big that sometimes real companies buy their rights just to use them as their own brands. It’s the case of Duff beer. A very interesting and long story that deserves a separate article. It was the lack of pressure or goals to achieve what made these branding creation unique. The question is: How could a couple of stoned screenwriters carry out these branding creations miles better than a host of professional ones? Well, it’s known fiction industry counts on creative thinkers; but the key of this brand creations was the lack of pressure or goals to achieve, and also, a relaxed whole vision of the business. What does it mean? It means simplicity, creativity and humility. Some things that corporate branding companies forgot somewhere by the way, while getting lost in a jungle of tricked graphs, numbers, reports and expensive dinners in Manhattan. Some fictional branding creations are considerably more popular and effective than real ones. How could a couple of stoned screenwriters carry out this job?